Abu Dhabi: April 16, 2018: Tamouh Investments, the leading Reem Island real estate master developer, has announced the completion of its latest project, Horizon Towers on Reem Island. 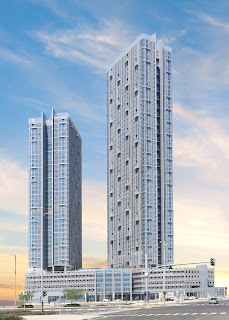 Consisting of the 57-floor Tower A and 38-floor Tower B, the mixed-used project Horizon Towers has been completed and is now ready for final hand-over to the property management company Three60 Communities. Financed with the support of Abu Dhabi Islamic Bank (ADIB) and Abu Dhabi Commercial Bank (ADCB), Horizon Towers features a mix of townhouses and 1 to 3 bedroom apartments as well as a range of retail outlets, restaurants, a swimming pool, sport pitches, gym and yoga terrace. Residents can enjoy the comfort of a modern luxury apartment with floor to ceiling windows providing panoramic views of Abu Dhabi’s mangroves, Reem Island and the city’s skyline. A mixed-use waterfront complex located in Reem Island’s in-demand City of Lights development, Tamouh officially launched its Horizon Towers project in April 2015 during Cityscape Abu Dhabi, adding 924 units to the market today. The developer will participate in this year’s Cityscape Abu Dhabi. Apartments in Horizon Towers will be available for sale and leasing at the leading real estate industry event, taking place April 17-19 at the Abu Dhabi National Exhibition Centre. The location of Horizon Towers on Reem Island, has a variety of running and cycling paths, a waterfront promenade, and sports fields, means residents can enjoy year-round outdoor activities. Ghanem Al Mansoori, CEO of Tamouh, said: “Tamouh prides itself on delivering projects that meet the highest of standards and provide residents with an optimal standard of living. Horizon Towers project, including construction and completion, was overseen by Trojan General Contracting, which will also handle maintenance of both towers, podiums and the surrounding grounds. Eng. Hamad Al Ameri, Managing Director of Trojan Holding, parent company of Trojan General Contacting said: “We are delighted to have achieved this milestone in our partnership with Tamouh, the successful delivery of this project demonstrates our resolution to shaping the Abu Dhabi skyline."